The Tamil New Year, Varsha Pirappu or Puthandu, is observed on the first day of Tamil month Chithirai, the first month as per traditional Tamil Calendar. In 2019, the date of Varusha Pirappu or Tamil New Year is April 14. Chithirai 1 is an auspicious day for Tamil speaking people in India (Tamil Nadu) and across the world, especially in Sri Lanka, Singapore, Malaysia and South Africa. A major highlight of the Tamil New Year is the viewing of ‘Kanni’ – meaning auspicious things. Legend has it that viewing auspicious things on this day will bring good fortune throughout the year. After viewing the Kanni, it is time for a ritualistic bath. After the bath, it is time to draw the ‘Kolam’ or Rangoli (Tamil New Year Kolams). The ‘kolam’ is believed to bring good fortune to the family members. Then, the doorways are decorated with mango leaves. After this the family assembles for prayers. The prayers begin with the lighting of the traditional lamp (kuthu vilakku). The lamp is placed next to a brass bowl with a short neck, which contains water and is decorated with mango leaves – called the nirai kudam. Then, it is time to head to the nearby temples to seek the blessings of the Gods. 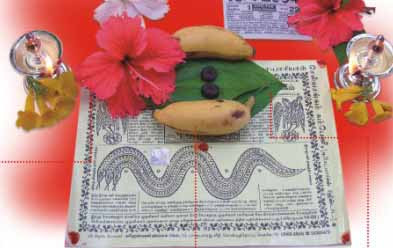 In some temples, people gather to listen to the Tamil Panchangam, which contains the predictions of the coming year. You can find more details about Tamil New Year and what to do on the day in this article. Note - Viewing of Kanni is not very common among many Tamilians but some communities do follow it. On the same day, the neighboring Kerala state observe Vishu, the Zodiac New Year. You can also explore more about the various New Years observed by Hindu communities here.